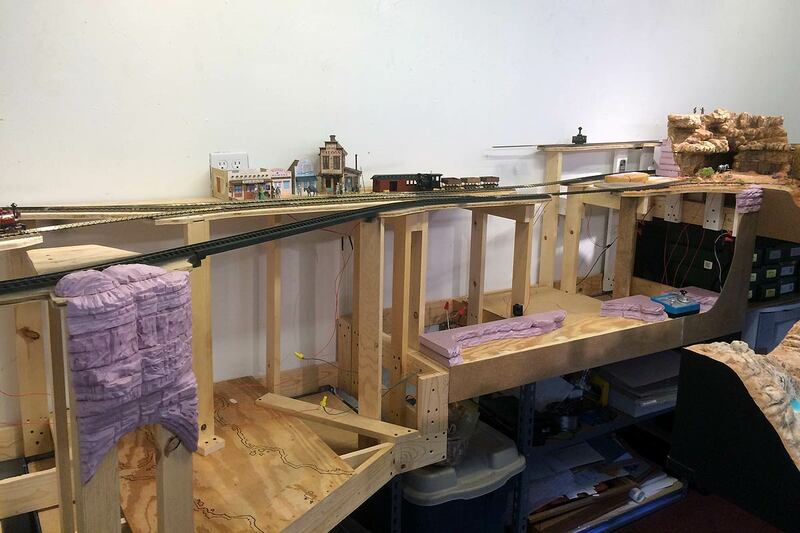 After a couple month's break, I'm back to work on the railroad, jumping right back into a big scenery project. Ive made some major and minor changes to the overall plan since the beginning of the year and there will be much more on that in a future post. 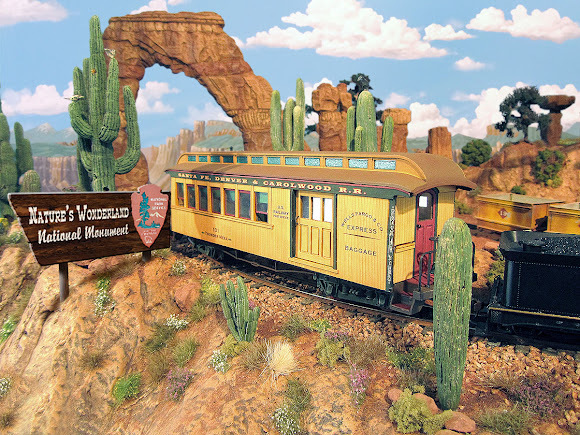 For now I'd like to bring things up to date on the scenery being built around Hanging Rock in what I'm now calling the Horse Thief Canyon section of the TMMC. The new cliff wall under construction below Hanging Rock. 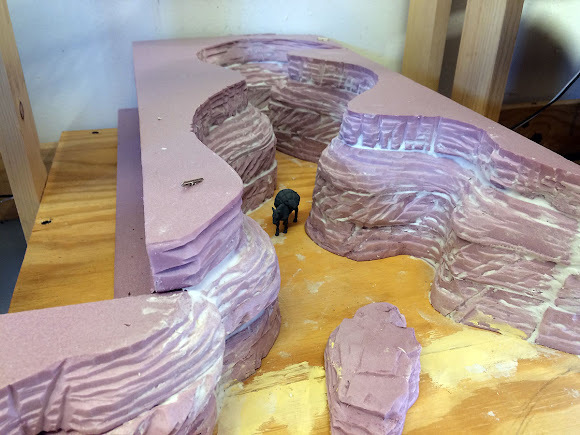 I'm trying something new on these big canyon sections, building the rockwork almost entirely from extruded polystyrene foam insulation board - or EPF for short (that's the pink foam board from your local home center). In the past I've used it mostly as a scenery base and finished with other techniques, but now I've found a way to carve the foam layers themselves into a convincing representation of sandstone. The Kato power pack nestled into the cliff base will provide DC control for an On18 mining tram running between Calico and Big Thunder Mine - much more on that in a future update. This is a big project, and I'll be spreading it out over several updates. 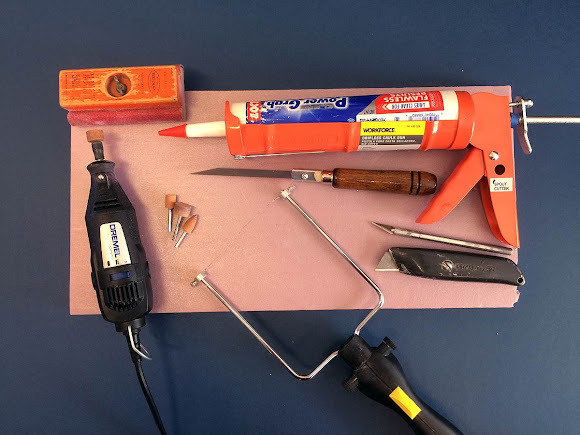 In this first part, I want to concentrate on the cutting and carving techniques used on the pink extruded polystyrene foam board (EPF). This insulation board is lightweight, relatively inexpensive, and has been used by model railroaders for many years as a scenery base. While building some rockwork for Rainbow Caverns, I hit on a new technique (new to me) for carving rock textures into the foam using a sanding bit in a Dremel rotary tool. 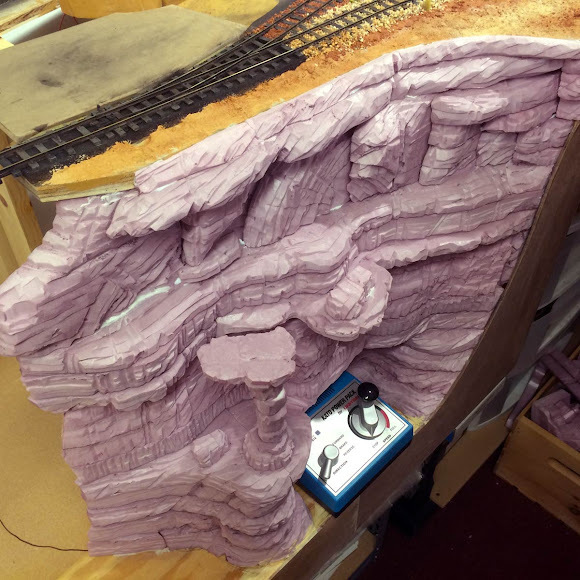 I was so pleased with the results that I decided to use the same method on the deep canyon sections of the layout too. It's a little labor intensive, but really no more so than my previous method of stacking foam layers and texturing with Sculptamold. I've got a ton of rockwork to do, so whatever method I choose is going to take awhile, but these EPF canyon walls will end up weighing much less than the equivalent amount of plaster or Sculptamold. An important consideration if I should ever have to move the layout. It's easy to add access hatches with EPF scenery. 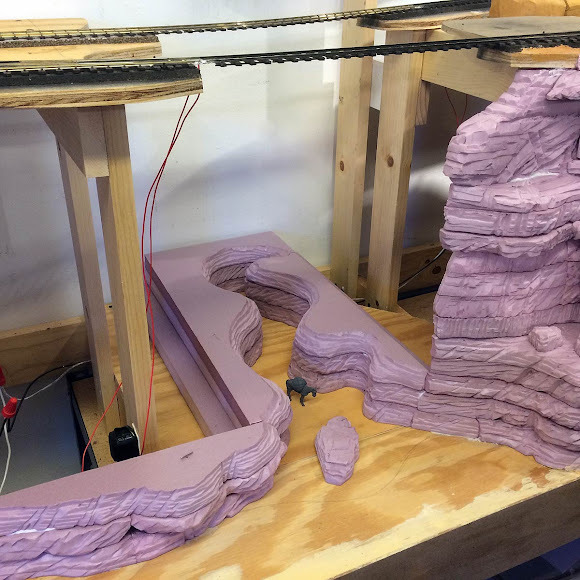 Here I've created a removable section of cliff below Hanging Rock so I can access the wiring back there when needed. Just push in at the corner and then slide the section out. A similar removable section will also be built into the cliff wall on the other side of the canyon. Overall view of the Calico and Horse Thief Canyon sections as scenery work begins. All of that space between track level and the bottom of the benchwork will be filled with EPF rockwork. The basic tools and materials used on the foam rockwork. Down below the bridges at Hanging Rock is a deep, serpentine defile known to the locals as Horse Thief Canyon. 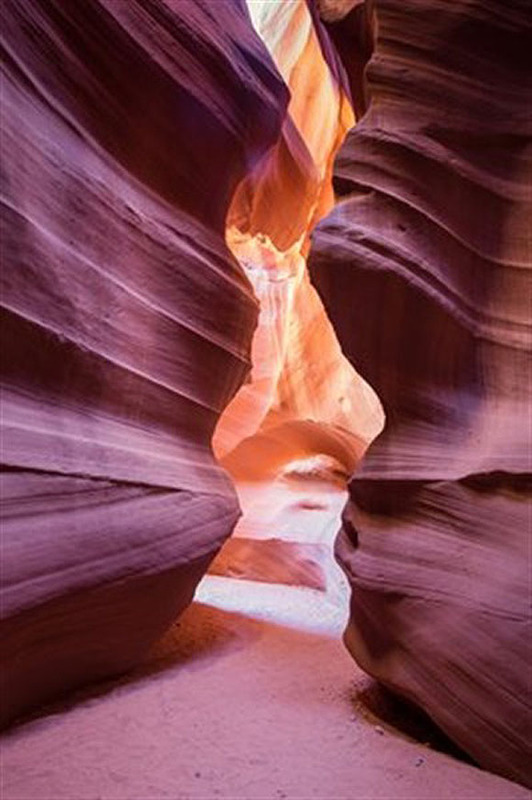 It's a classic Southwestern "slot" canyon, much narrower than it is wide; the kind often found worming back into the sandstone cliffs of Thunder Mesa country. This particular slot canyon is about 72 scale feet deep but only averages about 12' wide. A perfect hideout for horse thieves and rustlers - as long as it isn't flash flood season. Slot Canyon near Page, AZ. This is kind of the look I'm after with Horse Thief Canyon. 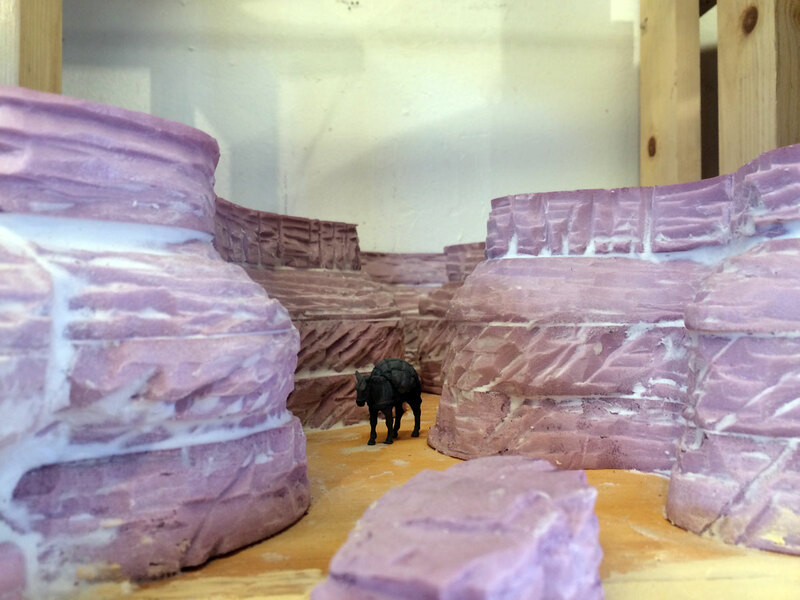 Here I've made a start on Horse Thief Canyon itself, cutting, carving and shaping the bottom three layers. This bottom section will be brought to a high state of finish before I move on to the next three layers of depth. That way, I won't carve myself into a corner by not being able to reach the depths of the canyon for painting and details. 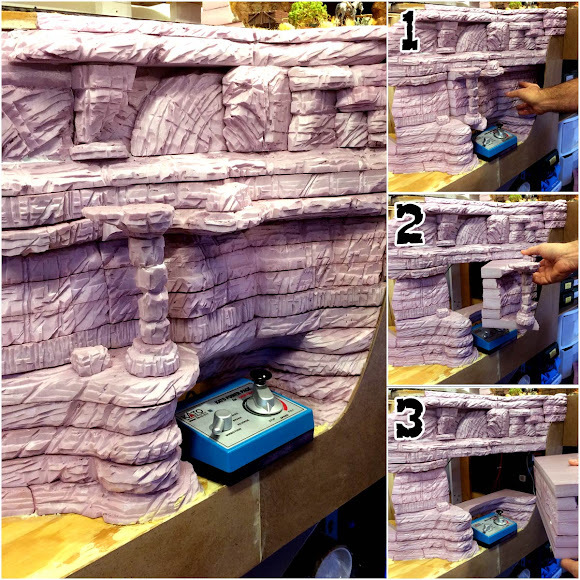 Each rock layer is cut to shape with a Woodland Scenics hot wire cutter, and then the exposed edges are carved into rocky textures using a variety of sanding bits in a Dremel Tool. The layers are then stacked and glued together using Loctite Power Grab Adhesive (see video below). One more layer of foam added and some spackling to start blending things together. In my experience, common household spackle works just as well as Woodland Scenics foam putty. In fact, I strongly suspect it's the exact same thing - but at less than half the price. I'll let this dry overnight and then it will get a base coat of tan latex paint. When complete, the canyon will seem to go on forever since it will be impossible to see the end due to built-in view blocks. At night, the flickering glow of an outlaw camp will be visible just around the bend. To wrap things up for this installment, here's a step-by-step how-to video on my EPF cutting and carving techniques. Thanks for tuning in, amigos. Next time up we'll do some painting and finishing of the rockwork in Horse Thief Canyon. Adios for now!